http://cloudbestpractices.net/wp-content/uploads/2017/09/toys-r-us-767x5... 767w, http://cloudbestpractices.net/wp-content/uploads/2017/09/toys-r-us-1024x... 1024w, http://cloudbestpractices.net/wp-content/uploads/2017/09/toys-r-us-788x5... 788w, http://cloudbestpractices.net/wp-content/uploads/2017/09/toys-r-us-150x1... 150w, http://cloudbestpractices.net/wp-content/uploads/2017/09/toys-r-us-500x3... 500w, http://cloudbestpractices.net/wp-content/uploads/2017/09/toys-r-us-400x3... 400w, http://cloudbestpractices.net/wp-content/uploads/2017/09/toys-r-us.jpg 534w" sizes="(max-width: 300px) 100vw, 300px" />With Toys R Us joining the ranks of businesses that fail to adapt to digital competition it would seem obvious that lacking a clear digital strategy today is a negligent death wish. This would suggest that we’re likely to see more big name casualties and the opportunity for aggressive digital disruption is still ripe. Many management experts propose a systematic way of responding to this threat is through quantifying and improving overall digital capability maturity. 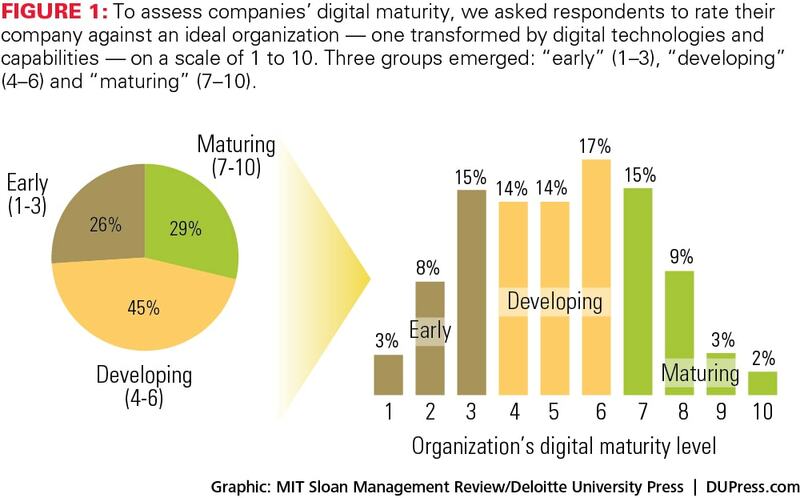 MIT recommends shifting the focus from digital transformation to digital maturity, and with Deloitte describe how to Achieve Digital Maturity through Strategy Driven IT Transformation. This polled the digital maturity of a number of organizations and charted them across this journey, highlighting the key activities of the mature leaders such as Walmart. The key insight is that they don’t treat it as yet another isolated IT system adoption but as a holistic transformation of how their organization works, impacting multiple dimensions of culture, talent and skills, across short and long term strategic perspectives. Digital Business Architecture refers to the use of Business Architecture for purposes of planning Digital Transformation, and the expertise offers the fundamental mechanism for improving IT organization maturity, most notably formally establishing an explicit link between IT and business strategy. A first key question to ask is how this relates to Enterprise Architecture. Most organizations already have well established EA teams, but often these are mainly technical in nature, focused on aspects like software architecture guidelines; the business alignment to executive strategy is still missing. This presentation Aligning Business Architecture to TOGAF takes on this question, exploring the specific connect with TOGAF and making a number of key mappings, in particular how BA designs like Capability Maps can be transposed on to EA designs such as a SOA (Service Oriented Architecture). CIO.com also writes in the Evolution of the Business Architect that they key function of the Business Architect is to act as ‘translator’, and that while traditionally they’ve sat within the EA team, this function is more successful when they become an active part of the line of business teams. How to achieve this connection is defined in the Business Architecture presentation from Credit Suisse, which shares how they have encoded the Business IT Alignment into their IT management governmance. Credit Suisse demonstrate a specific middle tier of activities that connects the higher level board strategy planning, with a lower one of IT implementation, the primary mechanic that can then begin to answer more specific questions about how IT generates $ Value for Money. Daniel Lambert explores this same cascading of strategy to execution in his Linkedin blog, expanding it to a level of detail that includes how the specifics of these strategies can be articulated through writing up user stories, the base unit of business requirements that IT teams are familiar with. As McKinsey writes in The Digitization of Business Processes, the building block of new digital business models is the automation of previously manual workflows, and BA can translate strategy and user requirements into the list of required Capabilities, that can then define what new Cloud services are needed to implement them. This relationship is explored in detail in Business Architecture and BPM, and forms the core activity of Cloud Solution Design. These organizational maturity improvements can first be applied within the IT organization. A key benefit of shifting to the Cloud is not just better computing capabilities but also a significant improvement in the agility of the organization overall, where for example ‘DevOps’ and ‘Continuous Deployment’ practices can be adopted to enable a faster cycle of requirements analysis being implemented into working software. Business Architecture helps quantify and provide a frame of reference for planning these improvements. A more mature IT organization will underpin and enable a more mature digital organization overall, protecting the enterprise from commercial threat and positioning them to instead by the bringer of disruption to their industry. The post Business Architecture-driven Digital Transformation Maturity appeared first on CBPN.